Utility power plants, supplying electricity to Chicago's streetcars and elevated trains. In the early 1900's, Commonwealth Edison began furnishing Chicago with what at the time, was a modern network of coal fired power plants. Prior to then, power plants had reciprocating units, using piston technology similar to traditional steam locomotives. But the new power plants constructed at the time instead used steam turbines, which proved to be more efficient. And Commonwealth Edison was then in a better position, to be a practical alternative over the electric railways generating their own power. The most standard electricity transmitted from these plants, is 12,000 volts at 60 cycles per second, or 60 hertz. But the three oldest plants listed (Fisk, Quarry, Northwest), were also equipped to transmit electricity at 9,000 volts at 25 hertz. In addition, the Fisk plant transmitted electricity at 20,000 volts at 25 hertz, to the three far south side substations feeding the Calumet & South Chicago Railway. The 25 hertz electricity was best for the rotary converters, supplying direct current for electric railways at the oldest substations. All power plants supplied 60 hertz electricity, which could be used by the newer substations equipped with rectifiers. Commonwealth Edison of course was controlled by Samuel Insull. And at the time, Commonwealth Edison only served the city of Chicago. Although in outlying northern Illinois, many of the electric utilities were also controlled by Insull. In 1932, Insull resigned from control of all of his companies. The electric companies outside Chicago eventually became Public Service Co. of Northern Illinois, which was absorbed by Commonwealth Edison in 1953. And as a regional electric utility operating in Illinois, Commonwealth Edison became an early major user of nuclear power, with all nuclear plants constructed outside the populated areas of Chicago. And within Chicago, the coal fired plants were gradually phased out. 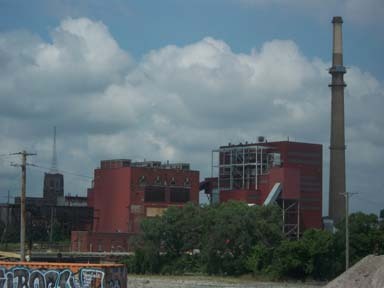 In 2012, the last three remaining plants (Fisk, Crawford, State Line) were all closed. Listed here, are only the "modern" coal fired plants within Chicago. Throughout the histories of many of these plants, the equipment was periodically replaced or upgraded. 100th St. and Commercial Ave.
Roscoe Ave. and California Ave.
25th St. and Quarry St.
Fisk power plant, as viewed from CTA's Orange Line.